PST Finder Tool is most widely used Software which Finds Outlook PST files within same Network Domain. Display attribute of Searched PST Files in the Network domain. Find MS Outlook PST Files: Outlook PST Finder helps the user to find PST files present in Exchange Server machine. Network PST Finder can find PST file on a single machine as well as all machine under the same domain. You can select any machine to find pst files. To list the PST files under exchange server, username and password are necessary for each machine. These details are necessary to list all the PST files. PST Finder Software display pst files as a list and show details of attributes related to PST Files. Details of outlook file are machine name, the size of pst files in GB, file path. 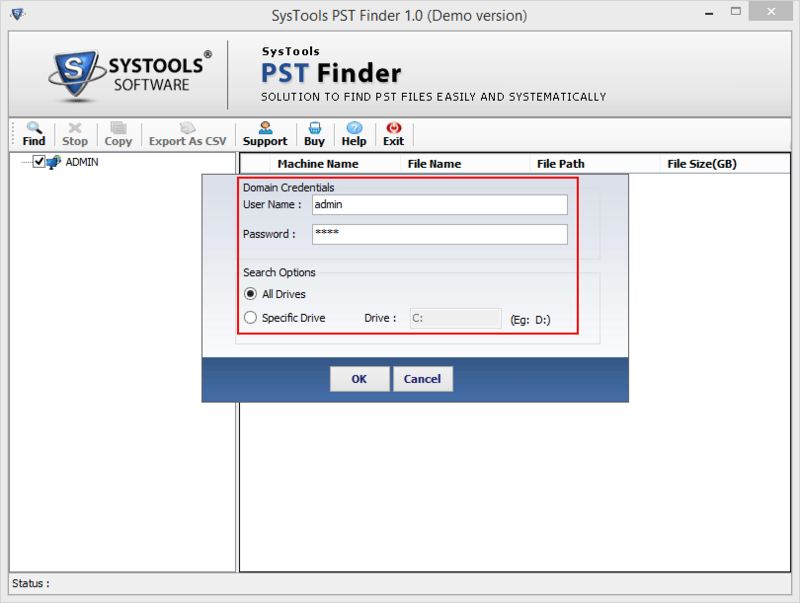 User can select the desired location to store the resulted pst files of different machine and save them on the local system or create a separate folder to store it. Simple and User-friendly Window panel interface, So that user can find, locate & copy PST with the help of Network PST Finder. Hence, it can be used by both technical as well as the nontechnical type of users. PST Finder - A Close Insight! 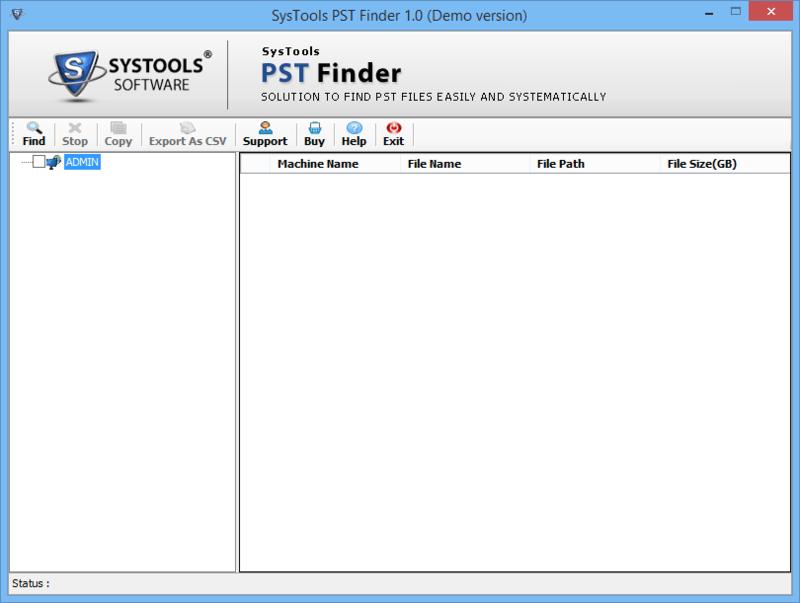 PST Finder Tool is used to Find and Save PST file machine under the same network of Exchange Server. The Outlok finder can provide facility to find Outlook pst files of specific drives also or all drives, by providing the right credentials of the machine of which user want to find PST files. PST Finder locate both file versions ANSI OR UNICODE of Outlook and can list both the files after search process. User can save the details of the search result in CSV format for later use and save listed pst file in the desired location, a user can select the save option to store it. A PST Finder helps a user to search all PST File under a network domain, Since sometimes user need to work on PST Files stored on a different machine but under the same network. 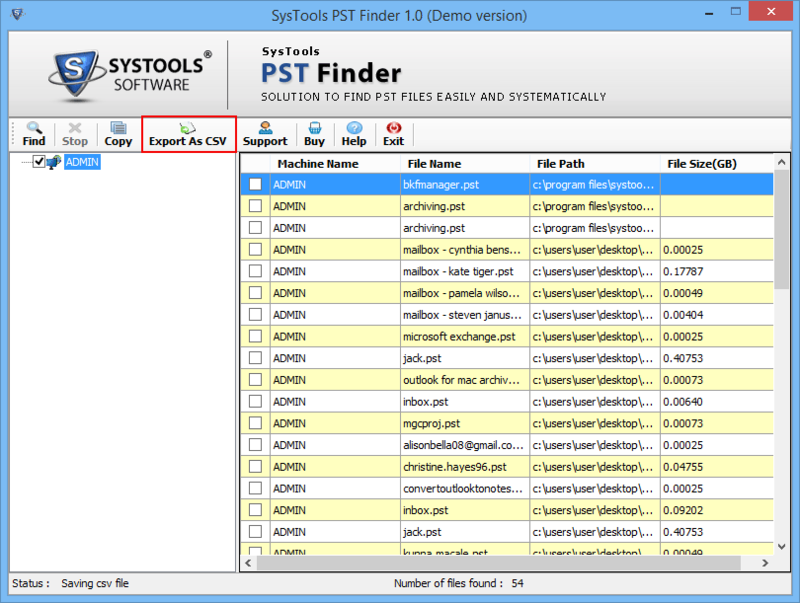 To solve these kinds of issue and store listed PST File in the safe location, you can go for PST finder tool. A software can search all drives or specific drives according to user need. Find and View PST files of Exchange Server of Same Network Domain. Install & Run Outlook PST Finder Software. Fill the Username & Password credentials, also select the All drives or Specific Drive option from search option. Now Outlook PST Finder will display the searching progress to locate the PST file from the selected machine. 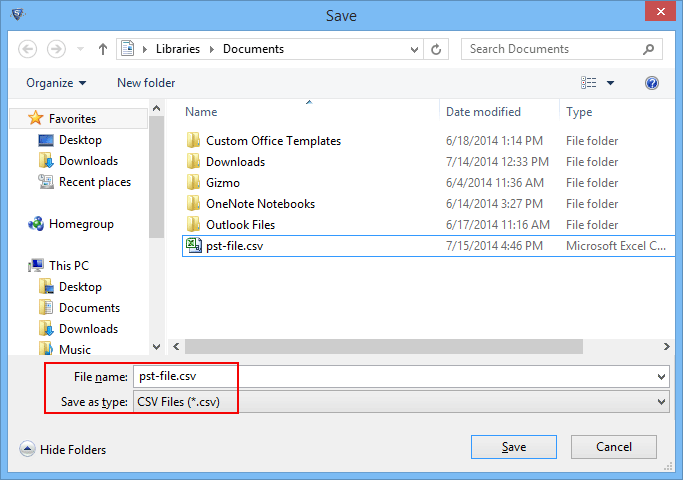 Select Export CSV option to store details of pst files such as file path, machine name & file size. Now Browse the location to store PST File in the local system. Software display window with message "CSV file saved successfully" when CSV file store in the desired location. 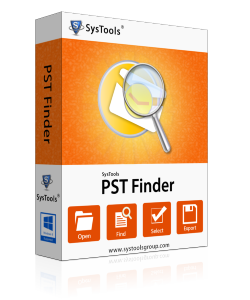 Outlook PST Finder Tool Replies All Doubts & Queries! Can we use PST Finder without Username & Password credentials? No, the user should know the domain credentials and should have full admin rights on the network to use PST Finder software. Is software search all types of PST Files? Yes, Software can search both types of files ANSI or UNICODE PST files. What kind of details of PST files shown during after searching? After searching PST files within network group, software preview the details such as machine name, file path on the machine, file size etc. To see details later, user can store this information in CSV format. How can I search Outlook OST File of Outlook in Same Network Domain? To find OST file in same Network Domain,user can buy OST Finder Utility. Sometimes, it is hard to find the location of PST files within Network Domain. Hopefully I able to find Outlook File finder software within Great Price to locate and copy Outlook files. Effective utility tool finds pst files. Just required Username & password credentials of the domain to finds all pst file of the domain network quickly. 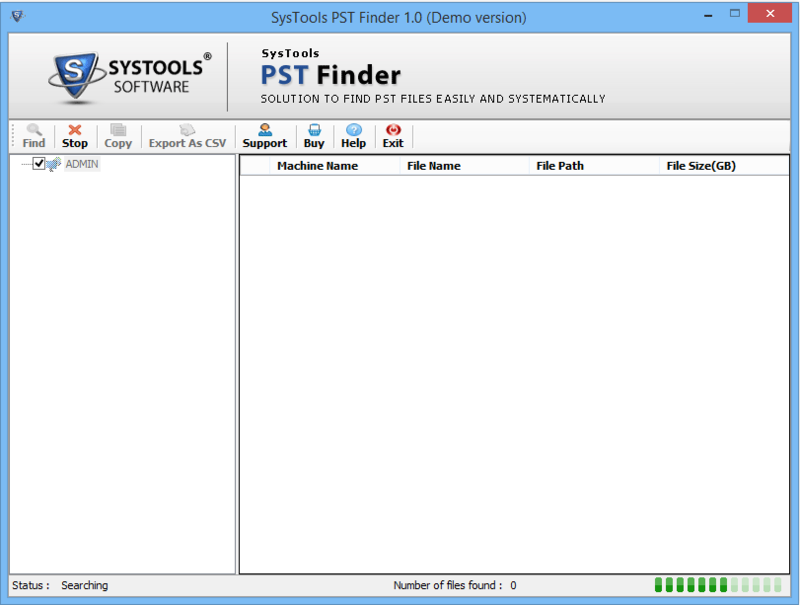 Outook PST Finder software works very well, the tool helps me a lot to find pst files from machines under network domain. Give me all details related to location of pst files, so that I can easily find files.